(Optional) - no lay-offs, but forward checks to then bends in behind. Set-up: 30x60 area divided into 3 zones. 2 end zones are 30x20 yards and central zone is 30x20 yards. Each team has 4 inside players and a goalkeeper defending a full size goal. -One team starts with the ball (Blue) and aim is to quickly pass the ball to a player in the end zone and score (Through Ball). When the attack is finished, one of the defending team&apos;s outside players (black in diagram) dribbles a ball onto the pitch and starts a new attack in the opposite direction (the black defender moves to the back of line on either side). Her team must move quickly from defense to attack in a 4v3+1 situation (the blue player who jsut shot the ball tracks back as the +1). -Practice should be continuous and uninterrupted at a high tempo. the players rest when they are outside. 1. Only 1 player from each team is allowed in a n end zone at any time. 2. 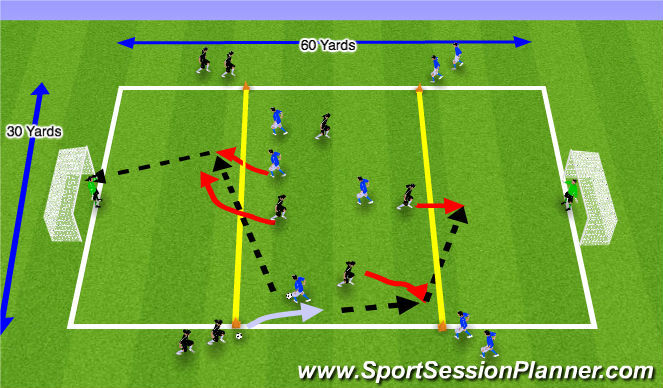 Free time and unlimited touches fro all players / Limite the time for finsihing the attacks to 10 seconds and limit the players to 2-3 touches in the end zones. Coaching Points: Play the ball into spaces so that we attack quickly. Take advantage of the space and speed of movement against the defenders. set-up: 6v6 + 3 Each team has two forwards, two center mids, & 2 defenders. 3 Neutrals. Neutrals have 1 touch to keep possession. Only time they have two touches if they are going to cross. 1. If oustide neutral takes two touches (second touch is a cross) attackers need to make synchronzied runs to get in behind defense. Optional: Teach forward to peel off in behind.